I personally hadn't expected much out of this day. Both moisture and shear profiles were quite good, with nice and strong mid-upper level shear and plenty of moisture below 500hPa, but I wasn't really confident when looking at instability figures produced by the AVN model. 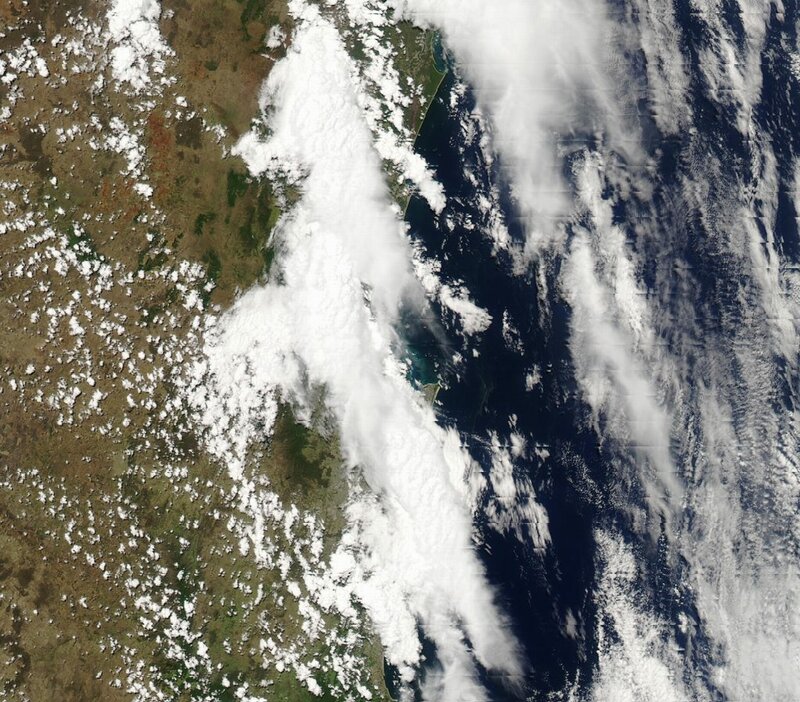 LIs were between 0 and -2 with Cape around 400-500 in the Northern Rivers. 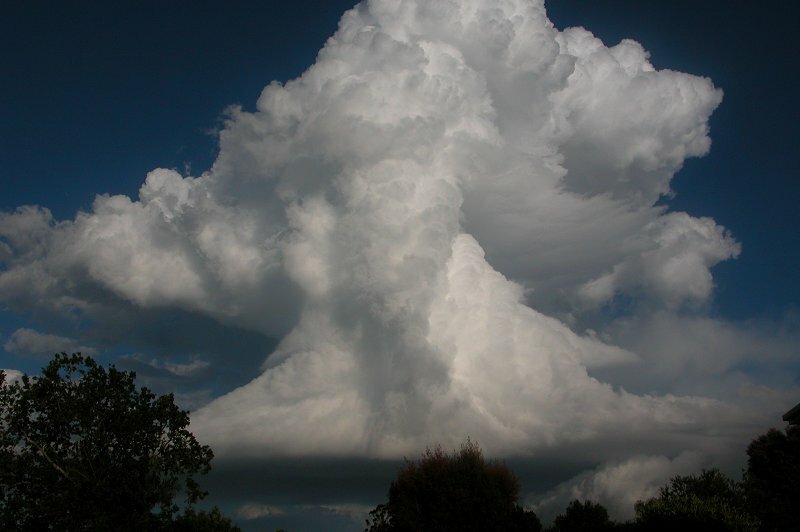 With such strong shear I expected updrafts to be torn apart. 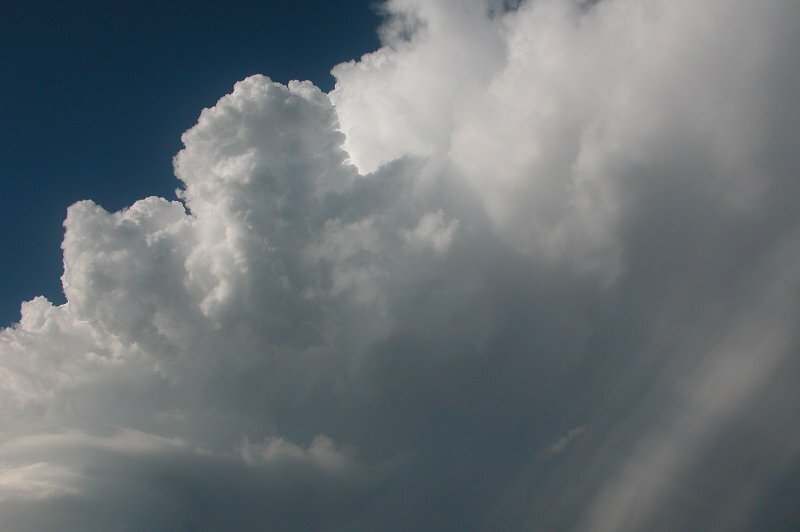 However storms did develop just after lunch, although they were fairly weak. 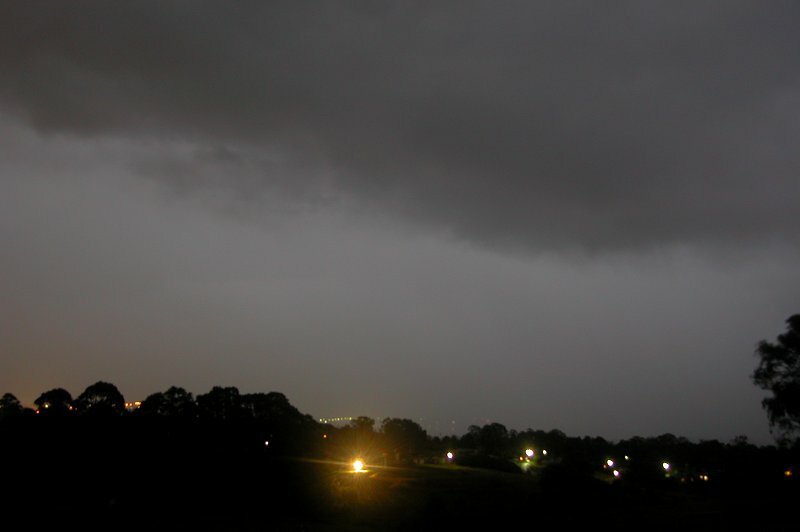 At my home we received some moderate rain and a few rumbles, but nothing really interesting. However as it moved off to the NE towards Byron it did seem to intensify, with quite a few rumbles and reaching pink on radar. 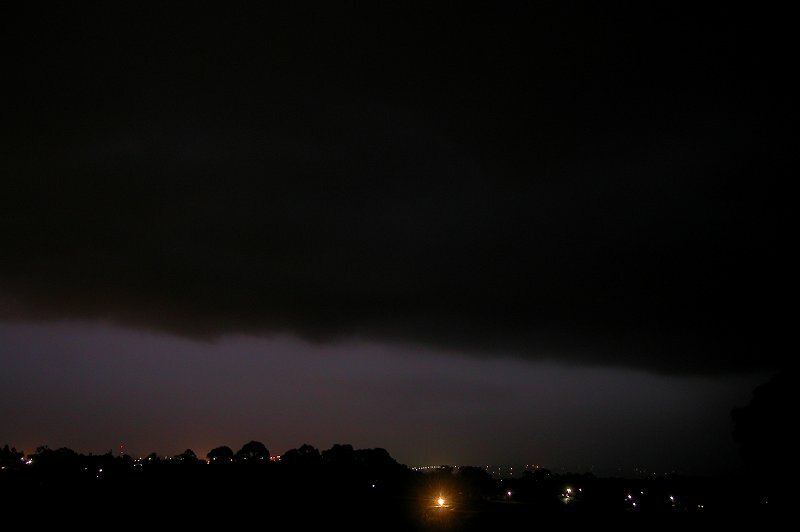 I managed to spot one CG as it moved away, revealing a high anvil as the rain cleared. After all the cloud, temperatures again rose to the mid-high 20s with the DP hovering around the 20C mark. Quite humid! So I spent most of the arvo in the pool, not keeping an eye on the weather. 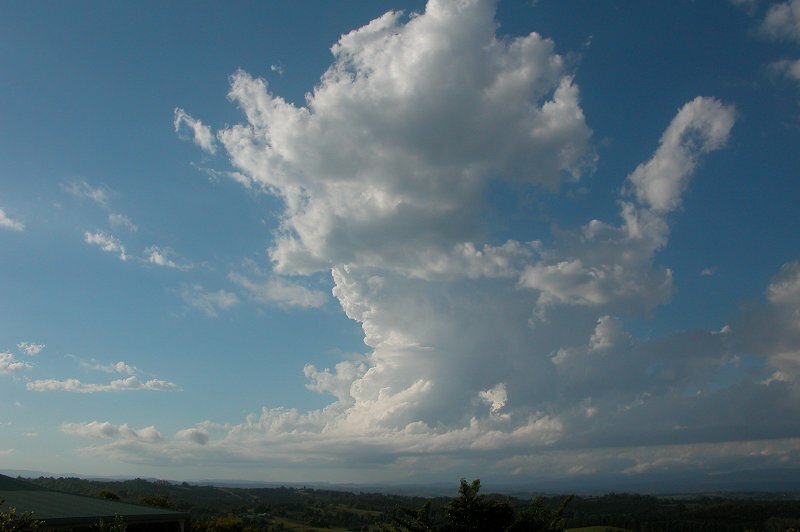 I was surprised later during the afternoon that a weak storm had developed. 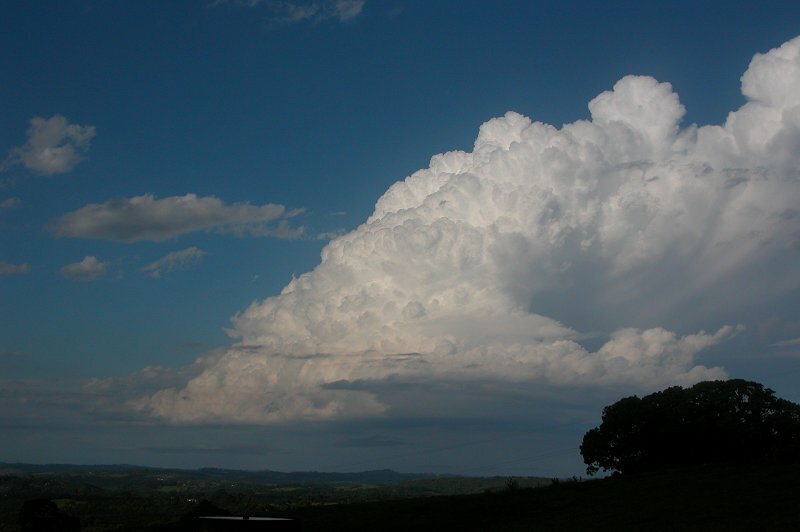 At 5.30pm I began photographing a cell to my NE which was producing fast growing updrafts which looked to be corkscrewing, but they were 'soft' looking. While watching this cell, another cell had popped up to my NNW which I was keeping my eye on. 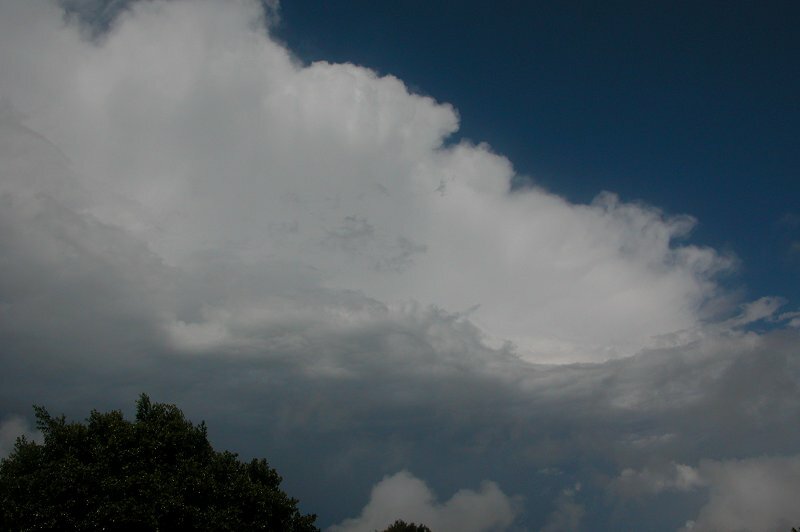 It was also producing fast growing updrafts but they would weaken quickly and the cell had barely produced any anvil. By 5.40pm things were quickly changing. Dad and I had tried to setup the video camera to do some timelapse to see if there was rotation in the cell that was now to our ENE, however the battery was dead after being used for something else the day before! So we gave up on that idea! The cell to my ENE was rapidly moving out of view so I ran down the back paddock to a spot which has a clear view to the ENE. Before heading down the paddock though, the cell to my N was looking like it may do the same thing as the cell ahead of it. I was hopeful anyway! As I got down to the paddock the cell to the ENE looked to have three 'notches' on it's main updraft which were quite interesting. It's a feature that would make me wonder if there was rotation, but it was hard to pick any rotation. It was a fair way away now. I was closely watching this cell for a few minutes before I remembered to have a look at the other cell to my north, and when I did I got a shock! 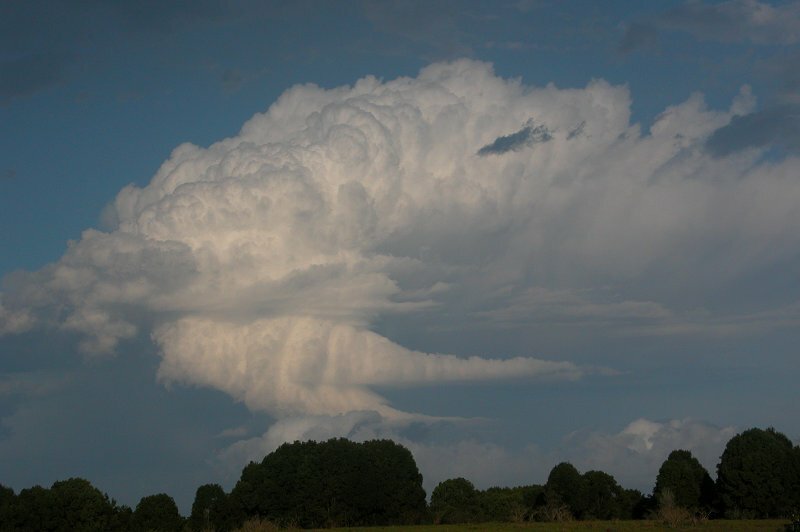 I could see the one single updraft pushing up and giving a weak anvil. It wasn't overly strong, but I could pick the corkscrew in the updraft! All of a sudden Rodney Wallbridge appeared in the paddock! 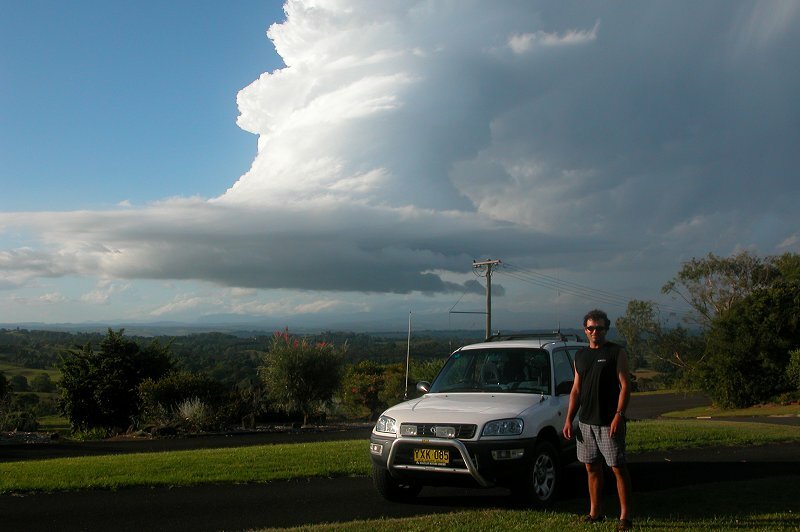 He had been driving to Michael Bath's place when he saw the cell and decided to come to my place so I could get a photo of his new storm chasing vehicle in front of what appeared to be a possible supercell, albeit a very weak one. It made for a nice photo! 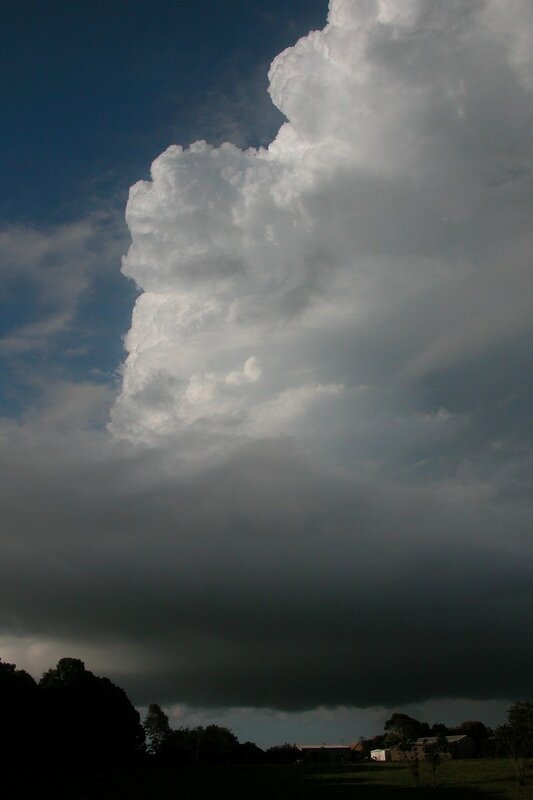 And so we sat and watched this cell as it continued to twist and move closer and closer to my place. It's SE track would bring it very close to my house, but it would slide just E of me. 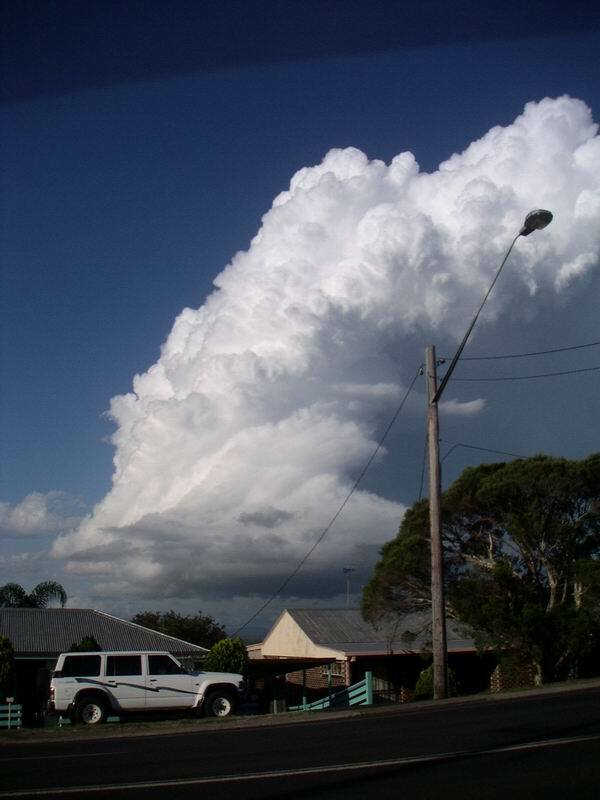 It appeared as though the rotation of the cell was too quick for the strength of the updraft. 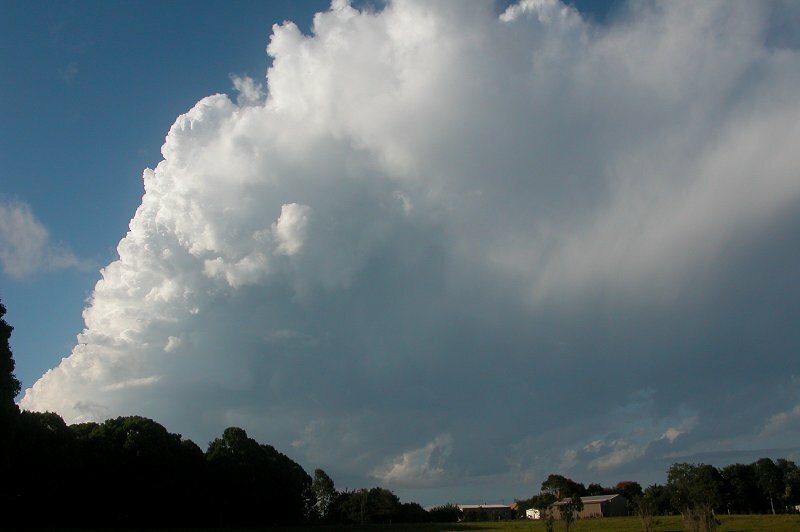 Where you would expect the main updraft to have a twisted look to it as well as remaining crisp and bubbly, the updraft on this cell appeared to be 'stretched' out, giving it a soft look. It now had a a decent anvil, which looked more solid than before. Rodney headed off to Michael's place while I watched the cell. 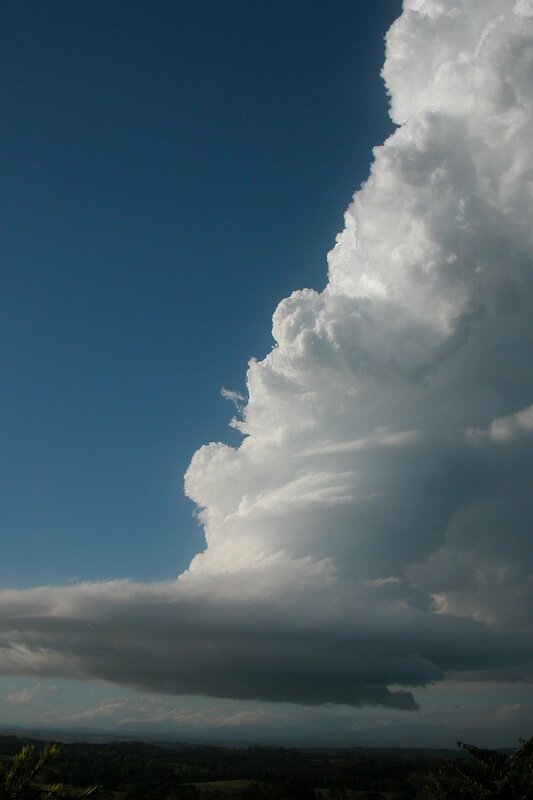 Dad had just hooked the camera up to the power point inside and so we finally started taking timelapse, but the cell was too close to fit the whole updraft in! 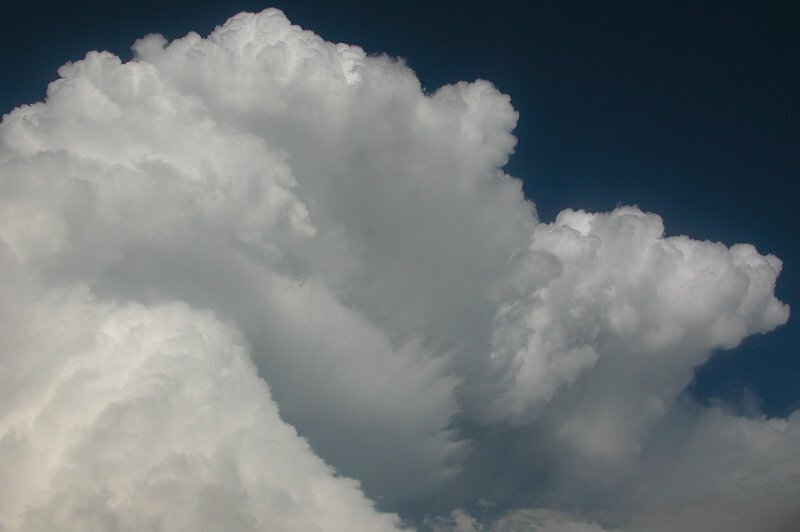 I ran down the paddock again for a quick update on the first cell I had watched, and it was still maintaining the notches on it's updraft region. I was also able to get a photo of the cell which appeared to have developed some inflow cloud into the updraft, which was almost over my house! 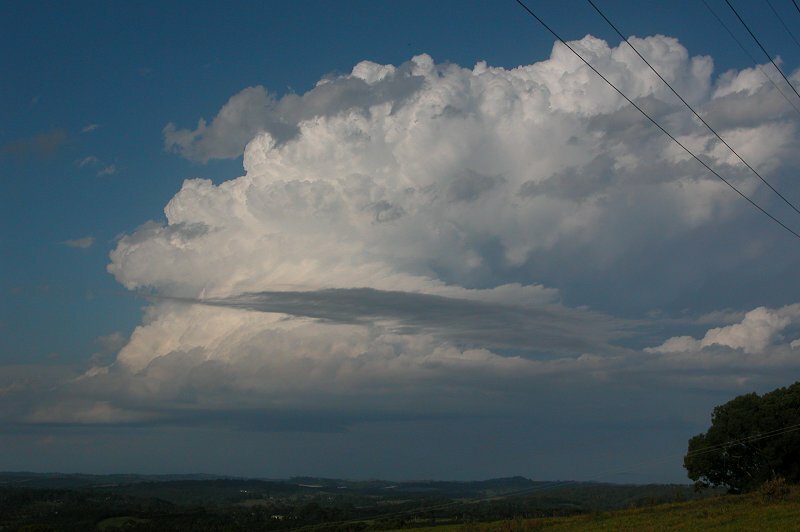 I came back home and watched as the cell now started to decay, although it maintained a nice rounded RFB for quite sometime! I was quite content with this surprise late afternoon action! Now, for the controversial part about the cell!! 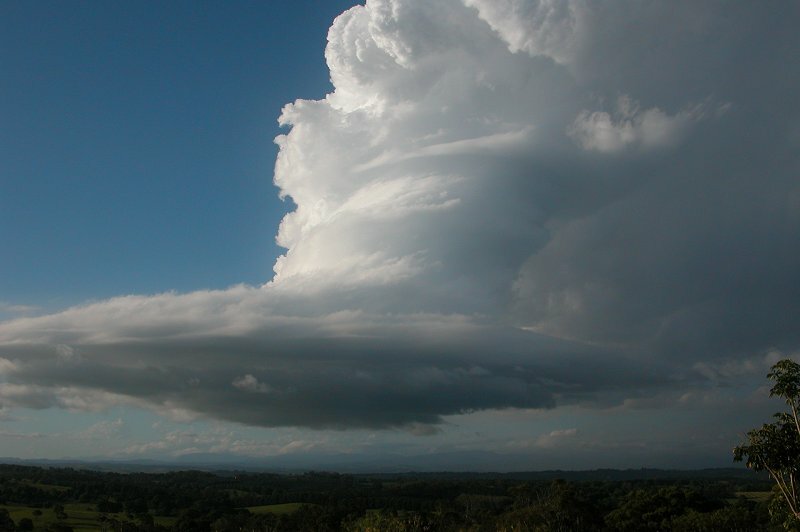 My very basic understanding of the definition of a supercell (very basic!) was that a supercell is a thunderstorm which maintains a persistent (which I and some others defined as 20 minutes) rotating updraft. 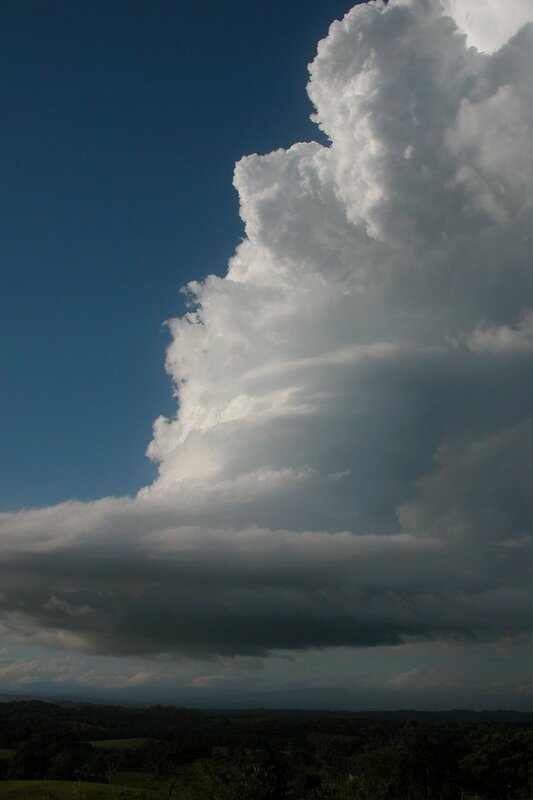 Based on this simple definition, I labeled the cell a very weak supercell. 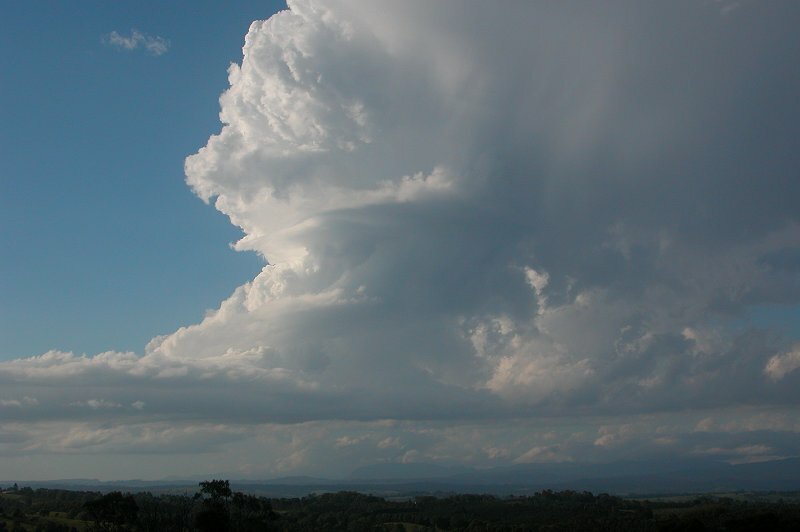 However some others believe that it was not a supercell as the presence of a persistent rotating updraft is not the only requirement to define a supercell. There are some great arguments for and against on the weather forum. I am certainly no expert at judging when a cell is a supercell when it doesn't give hints such as radar echoes of the cell and severe weather produced, so given the very unclear circumstances with this cell, my judgment is poor. But if we simplify the definition to what I outlined earlier, then I believe it would come close to meeting the requirements to make the cell a supercell. In hindsight, with the photo evidence I have, it is unclear if the cell had organised rotation beyond 15 minutes and that's why I think this cell can only be labelled a possible supercell, not confirmed. But in the end does it really matter? It looked awesome and was a pleasure to watch - and that's what it's all about! But the day didn't end there. 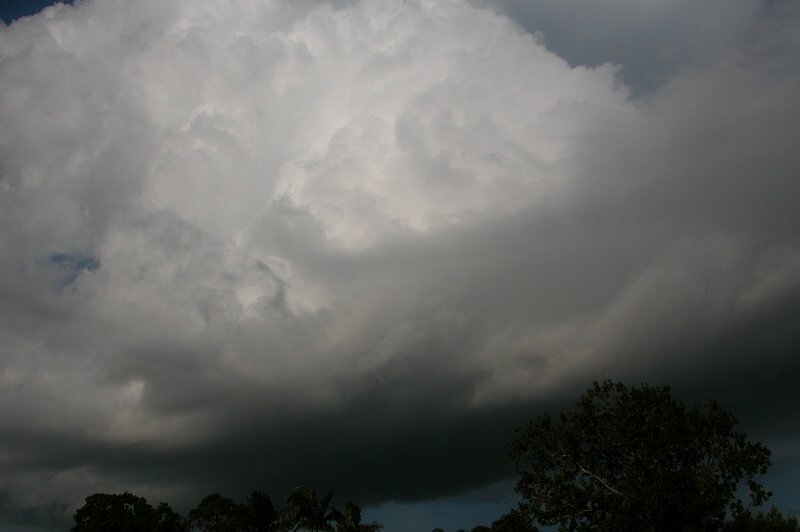 With a nice upper trough gradually approaching and cooling the upper temperatures, storms continued to develop through the Northern Rivers after dark. 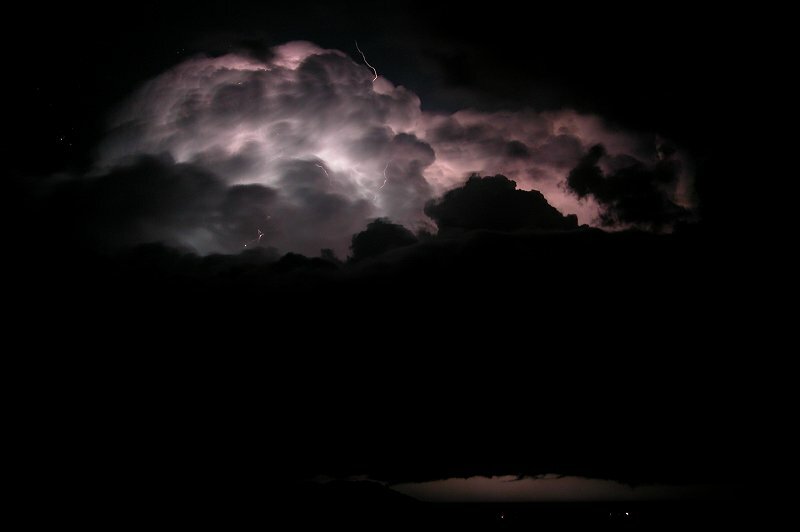 Around 9.00pm I was chatting to Rodney Wallbridge and we were both closely watching a cell approaching the Evans Head area. By 9.20pm we decided to head off after the cell as it now had a solid red core. We could see constant flashing in the distance that was obscured by a whole heap of low cloud thanks to the SE winds that had now established in the area. 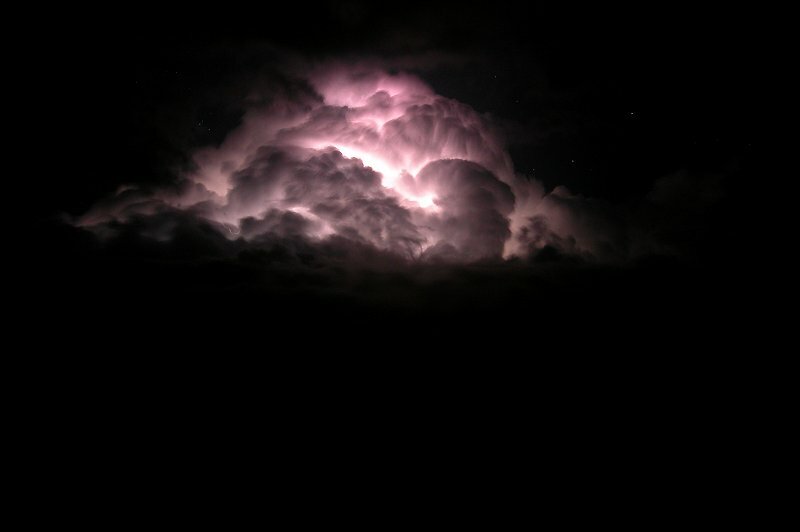 By about 9.50pm as we reached the S side of the Alstonville Plateau, the cloud cleared and revealed a large, solid thunderstorm that was constantly flickering with in cloud lightning! We were shouting with excitement every time a could to air bolt shot out the top, which was quite often! 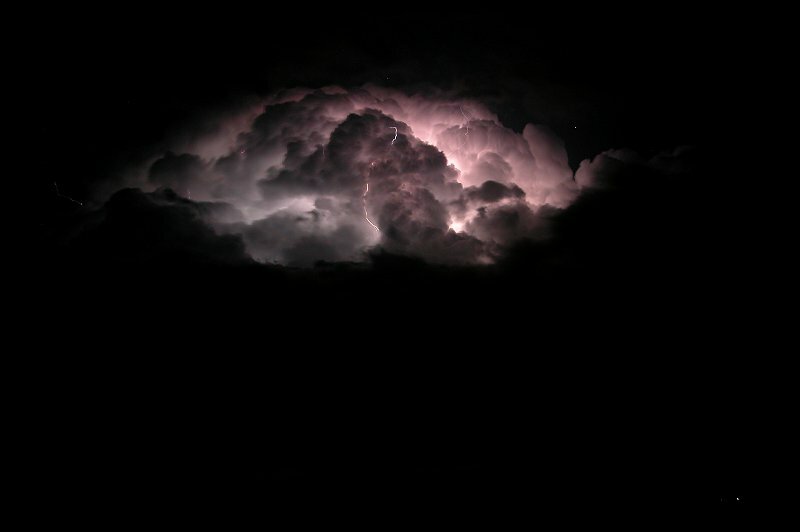 We watched this cell to around 11pm when it disappeared behind more low cloud. But alas, the chase still wasn't over! 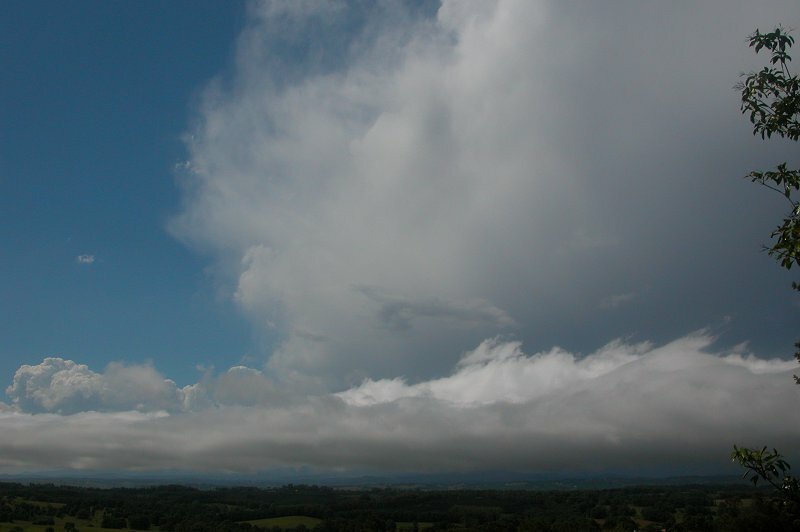 More cells had popped up just SW of Lismore and were heading towards the Goonellabah and Alstonville. We raced towards Goonellabah and stopped on Pineapple Road. 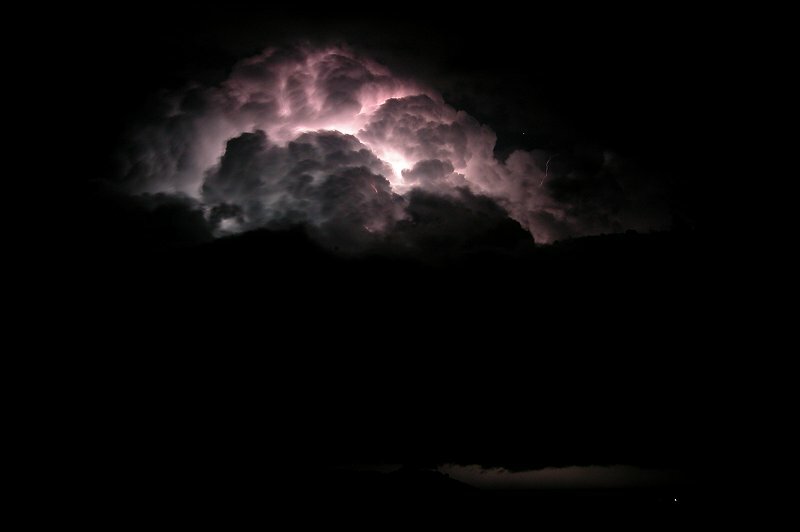 Lightning again was nearly constant in cloud flashes! Outflow from the approaching cell was quite strong, reaching 60-70km/hr. 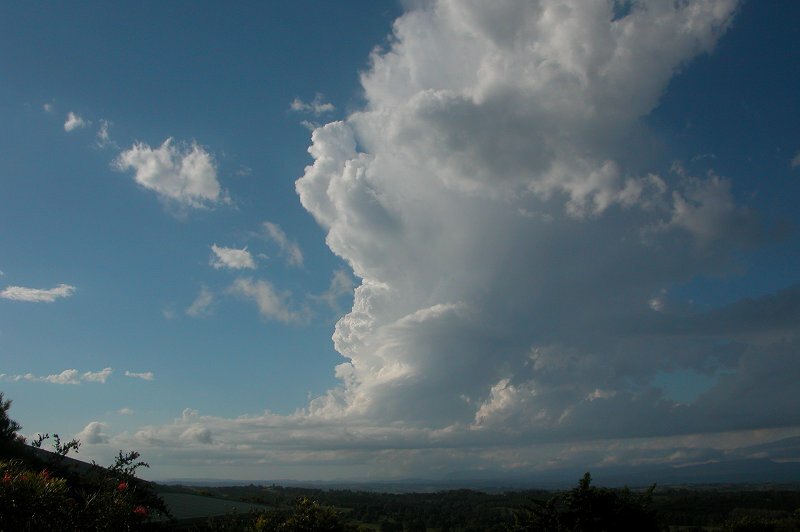 The cell produced one massive CG within a few kms of us before rain commenced. 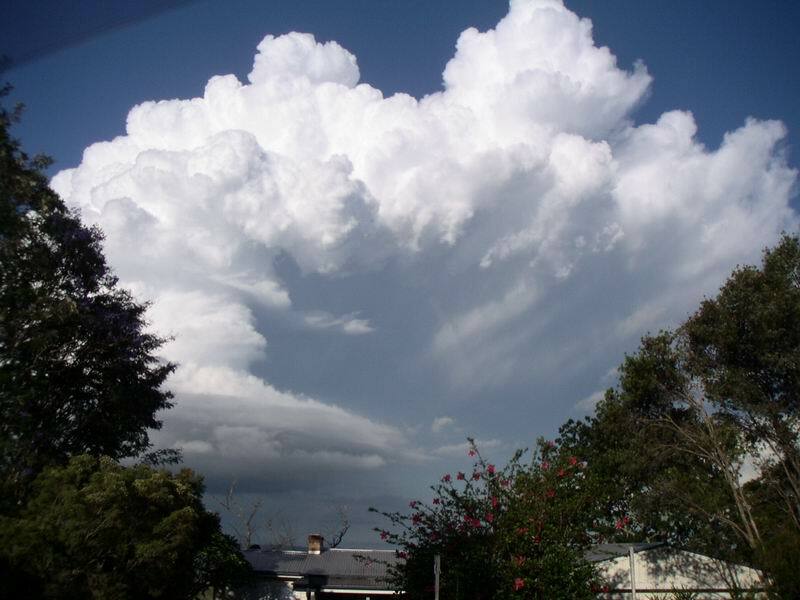 Rain rates were over 100mm/hr and bursts of hail up to 1cm fell every now and then. It was awesome driving in the heavy rain and hail and also with the sky being lit up constantly! Rodney dropped me back of at my place while it was still raining very heavily and hailing. 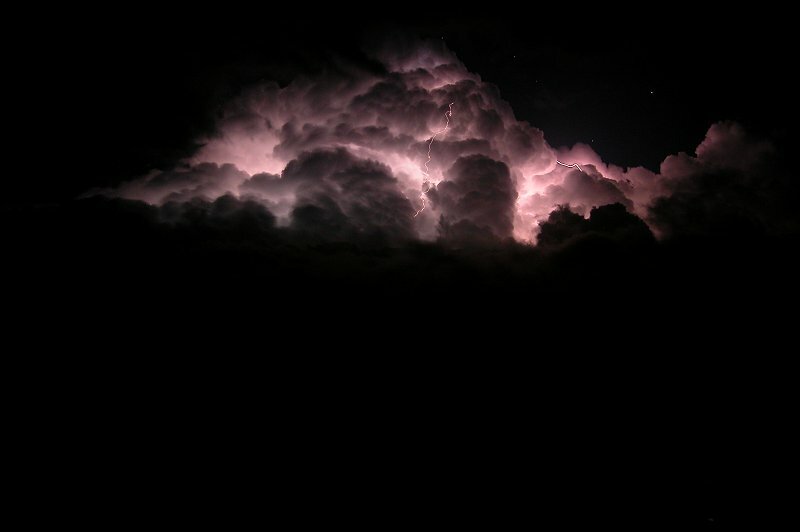 I went to bed around midnight with the awesome sound of thunder as the storm moved out to sea.